In a cooperative effort with various artists in the area of Chania, under the auspices of the Crete Regional and Chania Municipal Administrations, I am organizing a drive for donations to the Pediatric Clinic of the General Hospital of Chania. 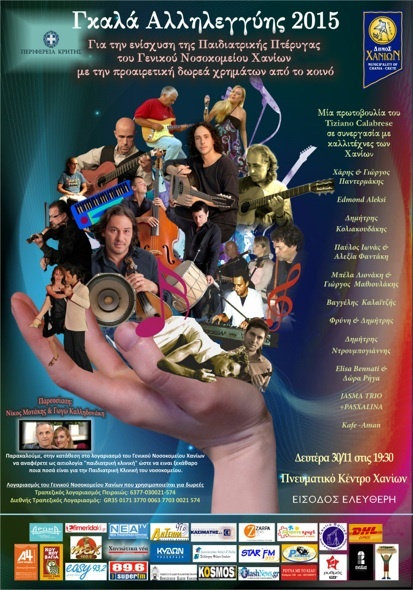 A successful concert was held on Monday the 30th in Chania at the “Pneumatiko Kentro”. From now through Monday, December 7, you are asked to give your support to this initiative with a donation that can be directly deposited to the bank account of the General Hospital of Chania (“Geniko Nosokomeio Chanion”). One hundred percent (100%) of your donation will be spent on the charitable goals because the people involved in the project are all volunteers. this way it is clear which funds are specifically for the Pediatric Clinic. In the next weeks I will keep you informed on the amount we’ll be able to reach and how it will be invested. We collected this amount both from donations during the concert (1280,00 Euro) and from donations (1220,00 Euro) of our main sponsors listed on the lower part of the cheque.